Chekhov: Can you explain your work, the organization where you work, and what you specialize in? Luis Xavier Solis Tenesaca: I work in two areas through a project with UNHCR (United Nations High Commission for Refugees) 1.- Consulting and advocacy for people in need of international protection, in this case especially for Colombian refugees who are the majority of people who need international protection by the Colombian internal conflict. 2. – Counselling and Advocacy in cases where human rights have been violated, in recent cases we have have had were against human rights violations by the police. if you come to Ecuador the first think you must do approach a human rights organizationor ACNUR in Ecuador, inform yourself about the request for asylum before you reach 15 days in the country otherwise the Ecuadorian government will not consider your request. Chekhov: What are the statistics, that is the number of Colombian refugees who are living in Ecuador and especially in the provinces of Sucumbios and Orellana? Chekhov: What are the statistics, that is the number of Colombian refugees that are living in Ecuador especially in the provinces of Sucumbíos and Orellana? Luis Xavier Solis Tenesaca: well in Ecuador there are around 56,000 refugees of which 90% are of Colombian nationality! The other nationalities are Palestinians, Haitians, Spanish, Cubans, etc. Chekhov: and how does the Ecuadorian government treat the Colombian refugees in comparison with that of other nations? Luis Xavier Solis Tenesaca: well you´ve got to remember the major part of Colombian refugees were recognised and registered in Ecuador in 2009-2010 after the Bombing of Angostura. Before 2012 Ecuadorian legislation was less rigorous until the issuance of Decree 1182 of May 30, 2012 which restricted access to asylum. We´ve heard from different areas in the government its position that refugees are an expense to the country principally Colombians which are the majority however this does not take into account the contribution they have made to the Ecuadorian economy with their labour and microenterprises. The government with the issuance of this decree severely restricted access to the right to shelter, so much that of the 100% of requests for shelter only 4% are accepted when before the decree it was about 60%. Chekhov: and they are rejected legitimate refugees now? Luis Xavier Solis Tenesaca: the majority yes, people who have elements of refugees, as well with such small percentages almost all are left out. Chekhov: and what happens when they reject one´s asylum, they have to return to Colombia or do they stay in Ecuador? Luis Xavier Solis Tenesaca: that´s the problem, in lots of cases when there are refugee elements, the need for international protection, they cannot return. [quote style=”1″]Suppose you are a refugee and your country does not protect you or does not want to protect you, therefore if he comes to seek refuge in another country there is a need for protection, either a regular or irregular armed group, that pursues them, threatens them, makes them fear for their lives or for their political expressions, social, racial, etc. 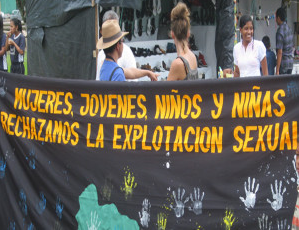 In lots of cases we have seen that the refugees stay in Ecuador without official documents which puts them in a vulnerable situation, they can be exploited laborally or sexually. [/quote]This is because the current government decree (1182) left off numbers to the right to be able to recognise victims of violence that the law had previously incorporated under the declaration of Cartegena, but it is no longer beholden in Ecuadorian law. That was part of the law and therefore should be applied. Chekhov: everybody has heard of the Ecuador´s most famous refugee, the Australian Julian Assange, can you tell us about some of the refugees that have fled violence in Colombia but have been forgotten by the Ecuadorian state and the rest of the world? 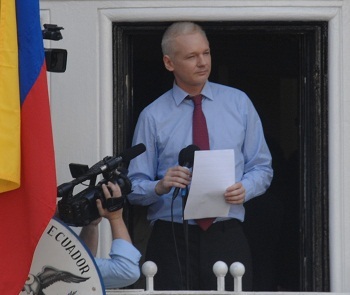 Luis Xavier Solis Tenesaca: …what you say is precisely the contradiction that has befallen the Ecuadorian state, already on a global level and in a principled way it gave asylum to Assange and a pass to Edward Snowden, however the life of Colombian refugees is not that easy. The fact of fleeing from a conflict of over 50 years is very complicated, to get to a different albeit close country, finding a place to live, where to work, where to raise children… These issues are really sobering to think about. A lot of the refugees in Ecuador that have fled the Colombian conflict were only able to bring identification documents so there access to rights is very precarious. Generally the same authorities that are making systems where [refugees] are unable to register because of the number of refugee visas, is the one for social security and education. This is the case for those who do find work, for the rest they have to look at finding more informal ways to earn a living, ways where they are exploited for their situation of always being on the move, which is to say the solutions aren’t comprehensive. There is still much to do in terms of providing refuge, while we agree that it is not just an Ecuadorian problem but an international one, but I think the government should deal with more attention to this sector. 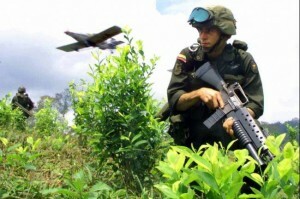 [quote style=”1″]The problems are greatest in the zones by the border where the both the Ecuadorian and Colombian civilian populations live in a situation of uncertainty. Luis Xavier Solis Tenesaca: Also you have to remember that 70% of Colombian refugees are women and children. Chekhov: and what happened to the fathers and husbands? For the part of ACNUR and other social organizations like us at the Committee of Human Rights of Orellana, we have tried to help, provide counselling so there rights are not violated, however the number that we meet is still small compared to the refugee population in total. Chekhov: can you tell us about some of these recent cases where the human rights of refugees have been violated by police? Luis Xavier Solis Tenesaca: There exists many occassions where because of the movement of people that need asylum do not have the correct documentation to travel throughout the country, whether thats because they havent sought asylum with the Ecuadorian state or because the authorities do not know how to identify a refugee and the rights they have. There exists and continues to exist various detentions by police of people who need asylum, however this is to ignore the constitutional rights of refugees who are in parts 9, 40, 41 and others of the Constitution guaranteeing freedom of movement, the right to asylum and refuge, universal citizenship. The police have no power in their grading of if a person is a refugee or not so all you can do is apply the documentation and if the person does not have it says they are a refugee or is in need of international protection what needs to happen is to refer the case to the Department of Redwhat to do is to refer the case to the Directorate of Refugees with their facility to analyse and consider the case. What we know is that there are still abuses principally when they detain refugees working in prostitution, starting first with that yes they are recognised as refugees and can work in whatever lawful activity such as prostitution, secondly you cannot be detained and have their documents withdrawn because the police do not have the power to do that. The best way to end these abuses is to denounce them so that they do not repeat and to sanction those responsible for denying these human rights. There also exists illegal detentions of refugees without respect due process, only because they are presumed to have commited a crime because of the stigma that much of the Ecuadorian authorities have of refugees from Colombia. Luis Xavier Solis Tenesaca: The topic of the global refugee crisis as you know is a phenomenon that isn´t going to finish any time soon, rather the situation has worsened, principally in the Middle East with Syria, North Africa, and how things are going there will be added to by more climate refugees and by the adverse conditions in which the world is developing…. For this I believe the solution legal, social, but in the background is POLICY. Chekhov: Right now in Australia there is an electoral campaign where the two main political parties are trying to demonstrate to a xenophobic and sometimes racist electorate who can create the toughest policies against refugees to send a message and stop them entering the country, what do you say to them? Luis Xavier Solis Tenesaca: …what is happening on a global level is to believe that economic crises and lack of employment is due to refugees, that economic migrants are those who take away jobs, however this is only an appearance to hide the truth, which is that the crises, lack of employment is due to the accumulation of capital in a few hands, in the minority, less than 1% of the population.. these political speeches stick in times of global economic crises and sometimes ordinary people usually believe them. It is therefore important to be more critical about where these speeches are coming from, speeches that are supported by the mainstream media that are repeated until they permeate in the minds of the population. Chekhov: I want to ask you of the armed groups: paramilitary, military, FARC Guerillas, who are causing the most violations against human rights? 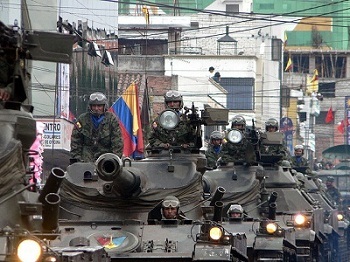 Luis Xavier Solis Tenesaca: generally I believe the Colombian military and the paramilitary. But it seems like the guerrilla in Colombia have forgotten there founding principles and there exists many rural people that are persecuted and killed. What happens is that it is a field of war, a civilian has to pay the armed groups without reason in many cases, if the armed groups see a frightened farmer, one that was forced to give water to the paramilitaries or the military, they are branded as an informant o vice versa. Chekhov: what is the level of refugees under the former Colombian president Alvaro Uribe in comparison with the current President Juan Manuel Santos? Luis Xavier Solis Tenesaca: Ive already mentioned that the majority of Colombian refugees were granted asylum between 2009-2010, during the government of Uribe after the bombing of Angostura, where the Colombian military bombed Ecuador. But in reality there is not a big difference in the amount of people that are request asylum in Ecuador between the government of Uribe or Santos. The violence still continues to be common, armed groups of the state or non-state continue to displace people in Colombia, the number of displaced Colombians is the biggest in the world with almost 2.4 million people and the numbers have not fallen.